Home maintenance and improvements add to the appearance and value of your home. Maintenance is paticularly critical for eliminating and preventing conditions that are conducive to termite activity in or around homes. Even the best maintained homes can have termite problem at some point, but an inspection by a pest management professional is the best way to head off these problems before they can lead to serious and expense damage. Even if these inspections are not done annually, you should do your own "mini-inspections" during routine maintenance chores. A good inspection includes looking not only for termites, but also for conditions conducive to their activity. This publication offers some tips on how to look for and to avoid termite problems. Figure 1. Thick layers of mulch covering the foundation can allow termites to move unseen. 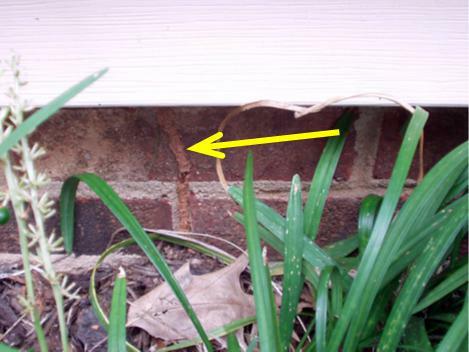 Siding should always be at least 6 inches (preferably higher) above "grade" (the soil line); otherwise, you could have decay problems as well as providing a way for termite tubes to go unnoticed (Figure 2, Figure 3). 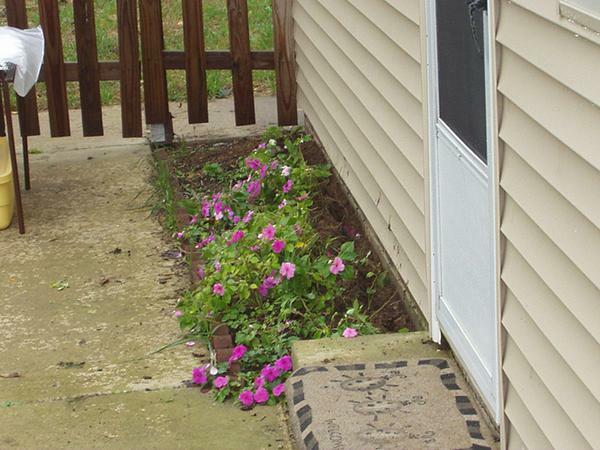 Never allow flower beds and other gardening to cover the siding. Never dig up the soil up within 12 inches of the house. This is the area that was (or will be) treated for termites. Digging up the soil or putting new topsoil over this area allows termites to bridge the treated soil and access your foundation. Plus, if you need a termite treatment in the future, those plant beds will need to be dug up (Figure 4). You need to be able to have a clear view of your foundation in order to look for signs of termite activity. Figure 2. Plants covering the foundation wall make inspections difficult. Figure 3. Termite mud tubes on the exterior of a house may go unnoticed if mulch or vegetation is too high. Figure 4. Keep shrubs and flower beds away from the foundation so they don't end up being damaged/destroyed if a treatment is needed later. When planting shrubs, you need to think about how large the plants will be in 10-15 (or more) years, not just in terms of their height, but also how wide they'll grow. 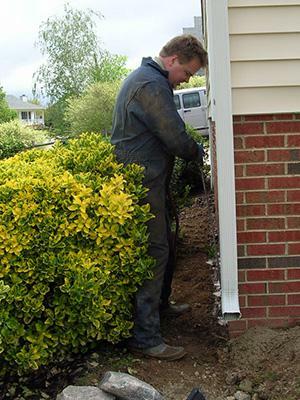 Do not plant shrubs too close to the foundation (Figure 5). 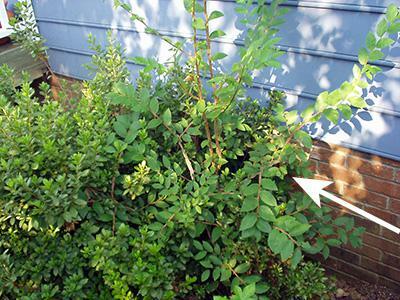 Shrubs that are too close to the house may hide termite (and other pest) activity. Tree/shrub limbs touching the house can damage siding and allow ants an entry point. 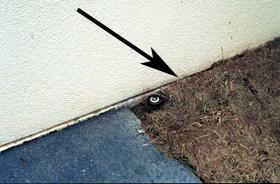 Prune shrubs to prevent them from blocking airflow through foundation vents (Figure 6). Figure 6. 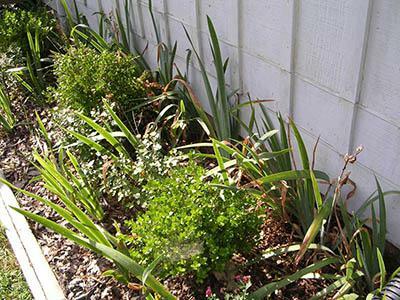 Keep shrubs pruned away from foundation to make treatment easier. Figure 5. Shrubs covering the foundation vent interfere with air-flow. 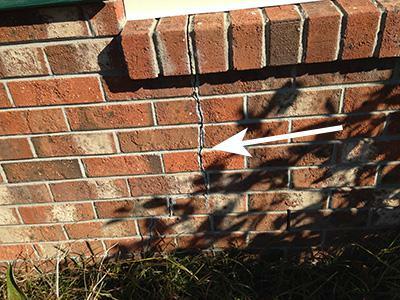 Inspect your foundation for cracks that may indicate a settling problem. 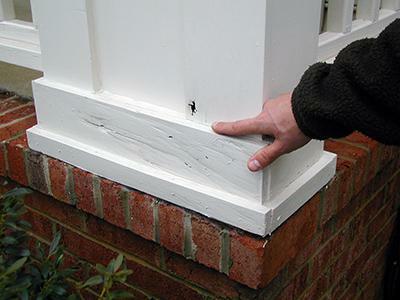 Termites can use cracks in your foundation footer as small as 1⁄32-inch to gain entry to your home. Check around doors and windows for signs of damage that could be from decay or termites. Make repairs to prevent further problems. 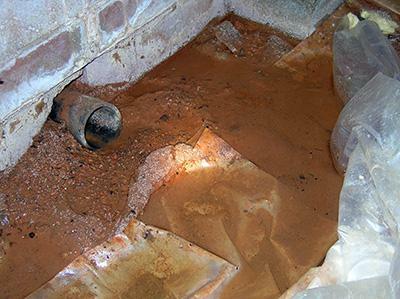 A wet crawlspace can create conditions conducive to termites. Fix the cause of problems such as wet soil or standing water in the crawlspace. This may require installation of a drain along the exterior (or interior) foundation wall. Installing the drain will disrupt any termite treatment done to the soil and possibly void your termite contract. Figure 7. Cracks in foundations may indicate settling that can allow termites entry to your home. Figure 8. Decayed wood on a porch column may indicate other problems as well. Figure 9. 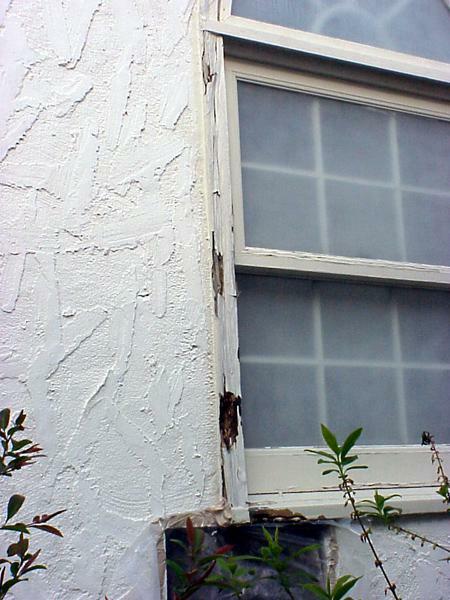 Decay in window trim could also be an indication of a termite problem. Figure 10. Standing water in a crawlspace is a condition conducive to termites. For information on termite prevention in new home construction see Termite Prevention - Approaches for New Construction.